Followed by my husband’s holiday party that same night. And then Alex and I leave for Madrid Tuesday (a.k.a. Christmas day) to see my mom and brother! Wowzaaa! Now, don’t get me wrong. I’m so totally grateful to have so many festivities and so much family and friends to share this season with, but it does get a teensy bit tiring. Agreed? So with that in mind, I put together a list of the 5 things you absolutely need to successfully survive the holiday party circuit this year. Check them out below! Say hello to your new holiday party drinking buddy! It’s called Morning Recovery and it’s here to help make your next day much more productive and much less painful. No seriously! I was very excited when our friends over at Morning Recovery sent us a couple of cases of their special recovery drink a few months ago. Even though I don’t drink excessively, I do still totally feel it the next day…even after just a couple glasses of wine! It’s such a pain because I don’t want to give up a night a fun (especially around the holidays! ), but I also don’t want to give up a day of productivity. Morning Recovery seemed to be the perfect solution to my problem! I’ve tried this drink three times, and I have to say, not all experimentations went well. But I think I have it down pat now! Experiment #1: Alex and I went out on a date night and enjoyed a few glasses of delicious champagne (and maybe a random tequila shot…because we love tequila! lol) We had our Morning Recovery drinks waiting for us when I got home, so we each chugged a bottle, laughed about how much we disliked the taste, and went to bed. Four hours later, I woke up with my heart racing and my mind running. After that, it was nearly impossible for me to fall asleep. Same thing happened to Alex, but we both blamed it on the alcohol…not Morning Recovery. Overall, I didn’t have a headache or stomach ache the next day so I was happy! But still VERY tired from not sleeping the proper amount. Experiment #2: Alex and I go out again for another fun date night…this time to celebrate my birthday! We drink basically the same stuff as we did in Experiment #1, and I take my Morning Recovery as soon as we get home. The taste is still not great, but I can handle it. After all, it’s a small bottle. Next thing I know, I’m wide awake after just a few hours of sleep and have the hardest time going back to bed. Okay, now I blamed it on Morning Recovery! Lol So I got in touch with their team, and they suggested I try it BEFORE I start drinking. The B12 vitamins could have been giving me too much energy too late at night, and thus not letting me stay asleep through the night. The taste isn’t the best. I’ve gotten used to it by now, but honestly it’s this weird mixture of chicken broth and peaches. LOL! Sounds yummy right? Luckily, they are working on improving the taste so stayed tuned for that! This stuff DEFINITELY works. But for me, it works best when I drink it before I go out for drinks…not after. Zero headaches or stomach aches for me. This drink is great! You better believe I’ll be drinking my Morning Recovery before some of the holiday parties I have coming up! If you guys use our code “CO”, you get $10 off your purchase! It’s totally worth trying…trust me. The powder is completely translucent so there’s no white/brown residue left over in your hair. It smells divine but is not overpowering AT ALL. Basically, you won’t be reminded that you’re wearing 10lbs of dry shampoo every time a single strand of hair blows in the wind. 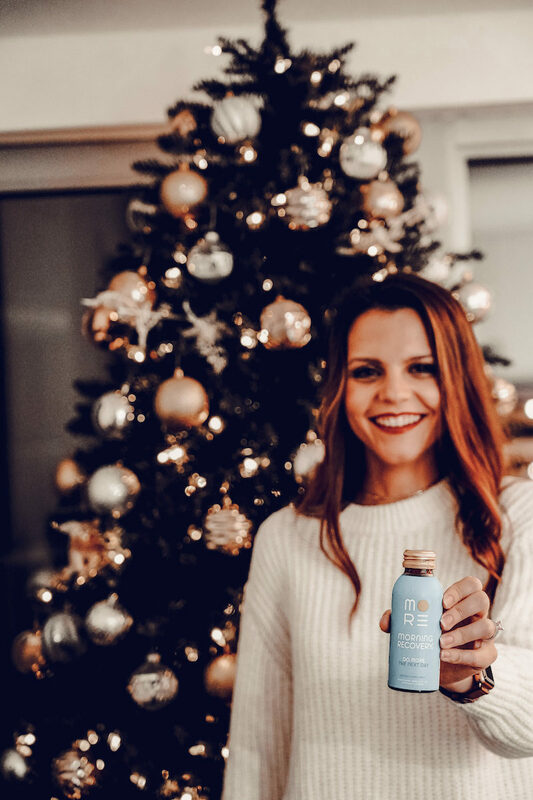 So basically, you can go from one holiday party to the next looking absolutely FAB without having to worry about completely re-washing and re-doing your hair. 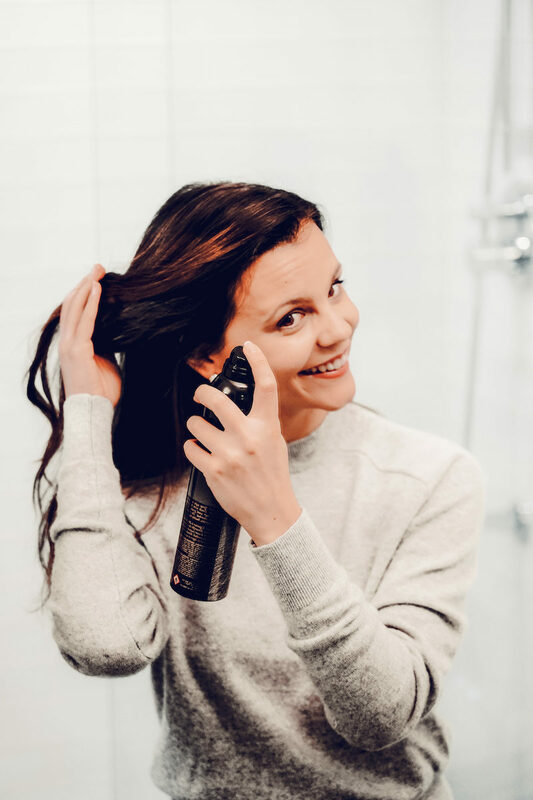 Just spray a little dry shampoo to your root, touch up the ends, and you’re out the door! Talk about a time saver! 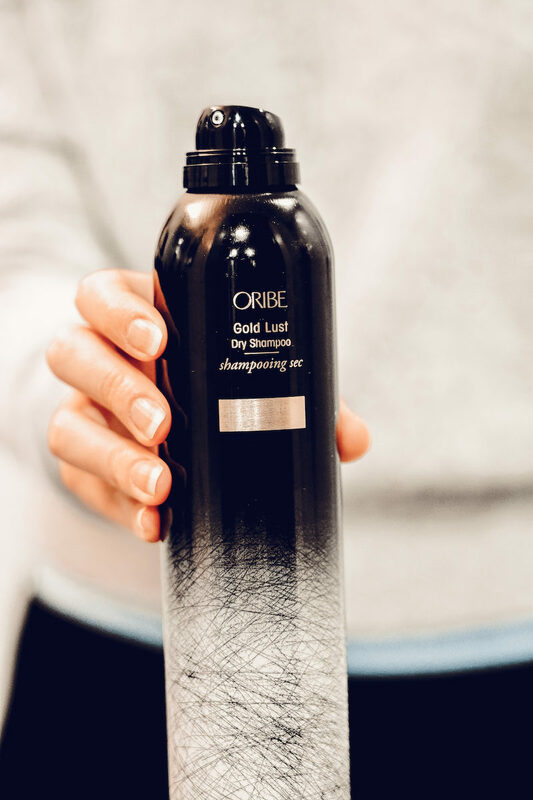 My only issue with this Oribe Gold Dust Dry Shampoo is the fact that it’s $44. It’s definitely on the pricier end of the dry shampoo spectrum, BUT…(big but)…the bottle is actually GINORMOUS. It’s a full 6 ounces of dry shampoo. So this sucker should last you quite a while! Let’s face it. We’re probably not going to be getting the most restful sleep as we bounce from one holiday party to the next. 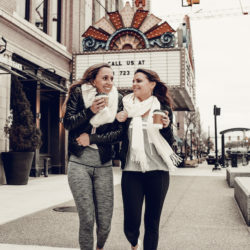 Some of us might be running on less than the ideal amount of sleep this coming week, but we can’t let our complexion suffer the consequences! 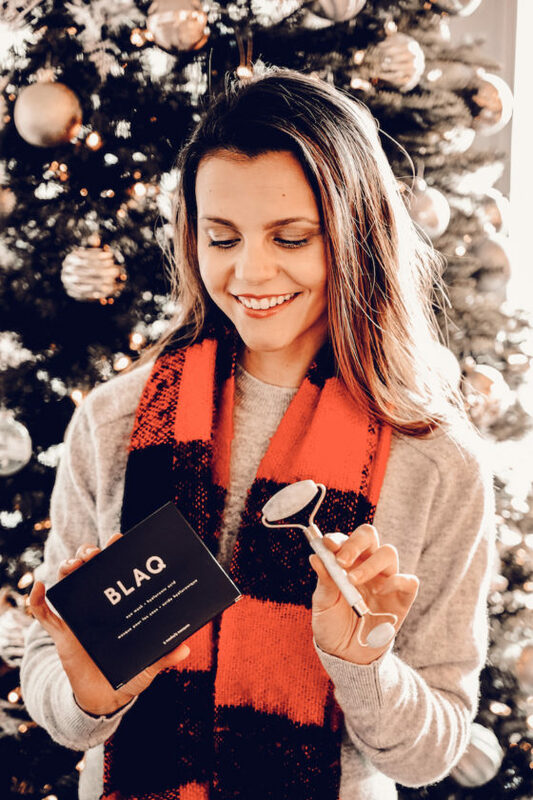 With that in mind, I introduce you to my new favorite set of eye masks: the BLAQ Hydrogel Eye Masks. 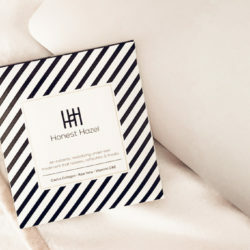 These eye masks are made to depuff and detox your poor little eyes after a night of holiday fun. Activated Charcoal: Removes excess oil and toxins from around the eye area to give you a brighter complexion. Hamamelis Virginiana Extract: Has calming anti-inflammatory and antimicrobial properties. I’ve been experimenting with these for the past two weekends and have quickly fallen in love. As soon as I wake up after a late night, I go to the bathroom, wash my face, apply my face cream and place the BLAQ eye masks under my eyes. I then go back to bed and close my eyes for 10-15 minutes to let the masks work their magic. Once I take them off, I rub in any residue gel all over my under eyes and eyelids, and I’m good to go! These eye masks really do instantly depuff my eyes and brighten them up so I don’t look as tired. In other words, these are an absolute MUST-HAVE for your holiday party survival kit. Price: Depends on the brand! 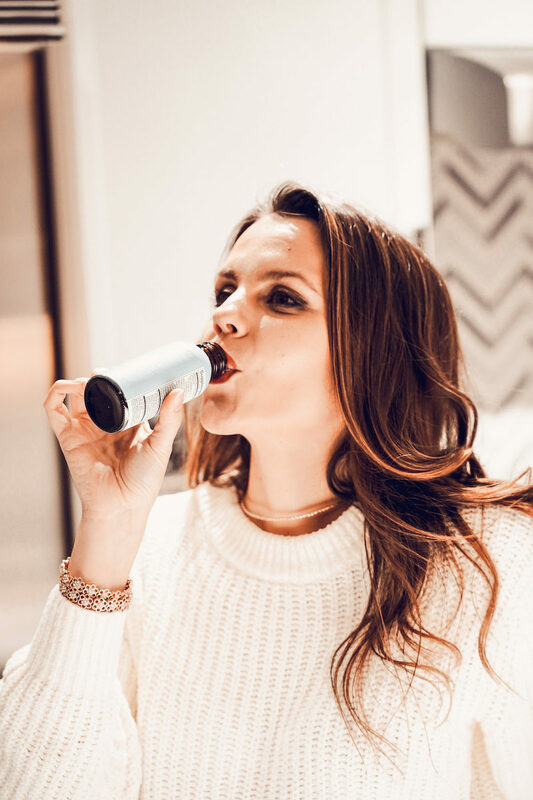 We got ours through FabFitFun, but we recommend trying the Mount Lai Jade Roller for $34. Okay, I must admit. I’m a sucker for all the delicious food that comes with the holiday season. Even though I typically follow the 90/10 rule when it comes to eating healthy (90% of the time I eat very healthy and 10% IDGAF), I tend to throw this ratio out the window during the holidays. I eat all the cookies, drink all the champagne and probably indulge in a few late night cheeseburgers. And I freaking love it! Boosts circulation which helps reduce signs of fine lines and wrinkles. Reduces swelling…so say goodbye to your puffy-a$$ face in a matter of minutes! Massages your skincare products deeper into your skin and helps with lymphatic drainage. Now you see why I’m obsessed? 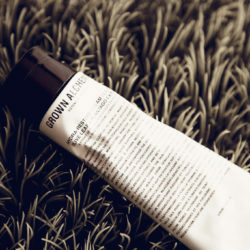 I literally use it every morning a night after I shower, wash my face and apply my moisturizer. You’re going to want to start under the eyes and cheekbones and roll outwards towards the hairline. Then, massage the jawbone in an upward and outward motion, starting from the chin out towards the bottom of the ear. Finally, don’t forget the neck! by Roll down the sides of the neck towards your clavicle. I’m telling you it feels ah-may-zing (especially if you leave the jade roller in the fridge! ), and also helps to release any tension in your face and neck. It might even help with headaches! In other words, ask Santa for a jade roller this year. You won’t be disappointed! If you’ve stayed with me this far, THANK YOU! I know this is a long post, but trust me, all of these products are serious must-haves to get you through the long nights and days ahead. And if you’ve followed the blog for some time, you’ll know that I’m not a lover of baths. I know, I know! I’m super weird, but I just don’t like my booty touching the bottom of a tub. Hahaha. However, I do totally believe in the calming and healing benefits of a bath for most people. So I’m going to hand this off to our resident bath-lover, Sam, so she can give you the deets on her favorite brand of bath salts! The water must be HOT. The hotter the better! If I’m not sweating, then it’s not hot enough. And honestly, if it’s only warm when you get in the tub, it gets cold way too fast and then…what’s the point?! There MUST be a candle burning. Preferably, the Boulangerie Sweet Vanilla Cinnamoncandle that I get at Anthropologie. There is NO better candle, friends! NO bubbles! Bubble baths are generally full of toxins. 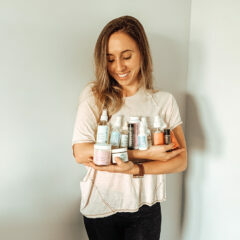 In order for the bubbles to be possible, there’s usually Sodium Lauryl/Laureth Sulfate which is a skin irritant and can corrode the skin (and there are some findings that it can lead to hormone imbalance and infertility…GASP!). Plus, there’s usually parabens and artificial fragrance in bubble bath soaps. 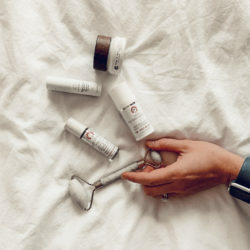 I always reach for salts when it comes to my baths for a number of reasons, but mostly because of their detoxifying properties. Bath salts do wonders for combating stress and fatigue, reducing inflammation, and just general detoxification. I mean how can you NOT love that?! (Cough, cough…Claudia! Just kidding…I totally understand her argument against baths.) Anyway, I’ve tried a lot of bath salts through the years (I feel like everyone gives them to me as gifts?!) 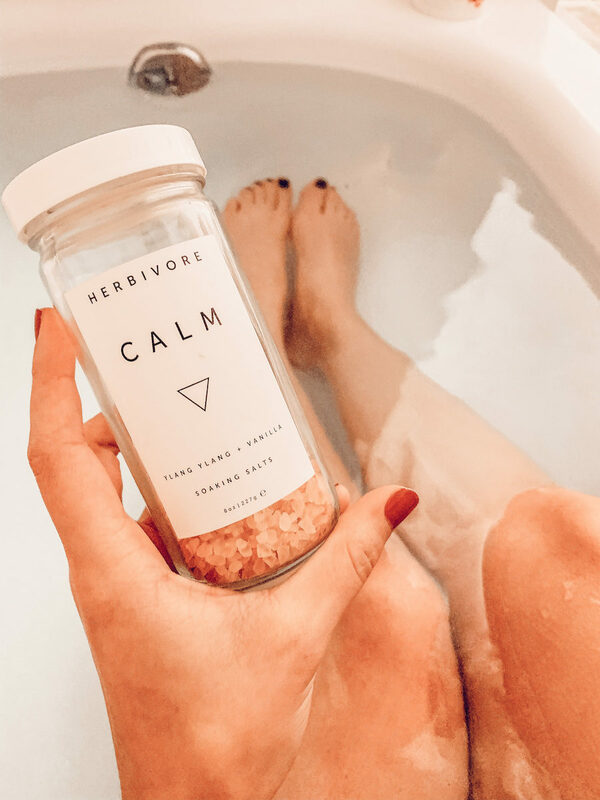 and nothing has compared to the Herbivore Botanicals Calm Bath Salts.